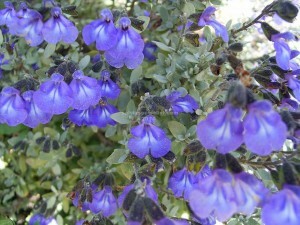 Thymoides is a lovely salvia from Puebla, Mexico, except that it is difficult to propagate!! It has tiny grey leaves reminiscent of a small leaved thyme and pretty blue flowers mainly in autumn winter. It is not at its best in very cold weather. About 25cm high and suckers lightly, which gives some chance of potting the adventurers. I don’t often have it available.